It was a recreation of a Tudor formal garden - lots and lots of squares. Nice! I do like a proper formal garden sometimes. Not to look after myself,though, good grief. I know - can you imagine? You'd need a troupe of fit gardeners I reckon. Which, come to think of it, would add to the view! That is a very fascinating pic, and the history of it is also interesting. I must google when I have time and find out more. Here you go - save you googling it! 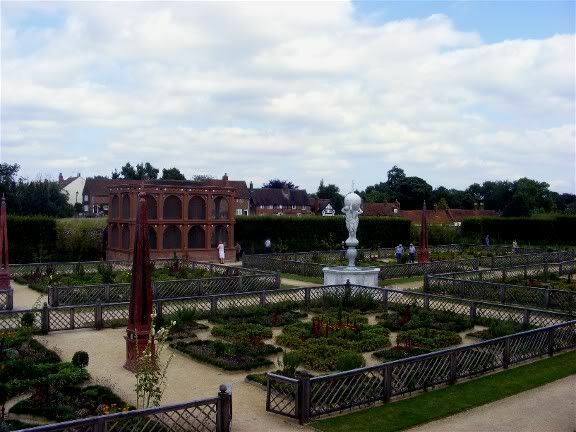 <a href="http://www.english-heritage.org.uk/daysout/properties/kenilworth-castle/elizabethan-garden/">Here you go</a> - save you googling it! I visited it a couple of years ago with <lj-user=gillo> who lives nearby. Thanks so much! What a wondrous place. I have grown up with Elizabeth 1, and her romance with Robert Dudley, it is wonderful to see the place where it happened. We only learned British history at school. Australia was such a young nation then that Australian history was insignificant. It is much changed now. I was interested by the structure in the distance. The figure looking into it clearly illustrates its size. So I had to go and google. An aviary. Wow. Perhaps you can ask Gill to give you a tour when we are in Coventry - that's when I was there.